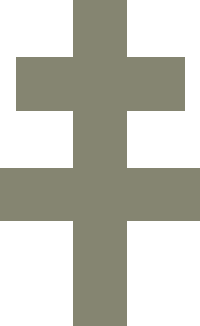 The two-barred cross, also featured in the coat of arms of Hungary, is a symbol of the tree of life among Hungarian Neopagans. Hungarian Neopaganism, the Hungarian Native Faith, or Ősmagyar Vallás (Hungarian expression meaning Ancient Hungarian Religion, or more accurately Arch-Hungarian Religion) as it is called in the local discourse, is a broad category defining the Neopagan movements which seek to rebuild an ethnic religion of the Hungarians, inspired by Hungarian mythology and folklore. These movements have roots in the ethnological studies of the early 20th century. The elaboration of a national Hungarian religion was endorsed in interwar Turanist circles (1930s-40s), and finally blossomed alongside other Pagan religions in Hungary since the fall of the Soviet Union. The boundaries between Hungarian Neopagan groups are often determined by their differing ideas about the ethnogenetic origins of the Hungarians, which have historically been a matter of debate. Many groups acknowledge the mainstream Uralic theory of the Hungarian origins, while other ones disallow it, endorsing Scythian, Sumerian or Turkic connections. The development of the Hungarian Neopagan movements largely rely on a background layer constituted by the work of individual Fidesz and Jobbik political formations. The study of the ancient religion of the Hungarian people has been hanging together with the debate on their ethnogenesis. Fringe theories about Scythian and Sumerian origins were supported by early ethnologists. With the mid-19th century Romantic influence on ethnology, new studies on folklore were carried out, and the mainstream religious studies circles gradually welcomed the conception of the original Hungarian religion as based on shamanism, with relations to Uralic and Siberian traditions. This stream of thought was hallmarked by Arnold Ipolyi's impressive Hungarian Mythology. The idea of an ethnic Hungarian shamanism was later carried forward in a psychoanalytical way by Géza Róheim in the 1920s, and by Vilmos Diószegi with field work in Siberia in the 1950s and the 1960s. The shamanic character of the original Hungarian religion, whether the native faith is fully described by it or it was only an aspect, is accepted by the majority of scholars. Thus, further studies focussed on the ethnic Hungarian shamans, the táltos. The idea of a national Hungarian religion was later endorsed also in the Hungarian Turanist milieu in the 1930s and the 1940s, generally focussing on a kinship with both the Uralic peoples and the Turkic peoples. Hungarian chronicles of the 13th century still make reference to "magicians" as táltos (shaman) persons. The táltos tradition survived until the World War II in rural areas, where certain people were still considered as táltos by the local community, though they practiced weather-magic only. Diószegi describes the táltos as specialists who are able to get controlled ecstasy (rejtezés). The position of the táltos is reached by heredity or vocation; the process includes typical stages: after initial resistance to vocation and the various symptoms of the "shamanic disease", the chosen by the gods finally accepts his role. The táltos gets shamanic knowledges at a young age, through shamanic journeys in days-long dreams, in which the main initiation goal is climbing the égig érő fa ("sky-high tree"), also called életfa ("tree of life"), világfa ("world tree") or tetejetlen fa ("tree without a top"). Diószegi considered many elements of the Hungarian shamanic tradition to be Hungarian ethnic specificities, not found in Central Asian traditions. Currently, the Hungarian ethnology of religion, primarily the academic circle of Miháli Hoppál, has an important role in international shamanic studies. The ethnological accounts define the táltos, and generically the shaman, as that whose social functions are to heal, prophesy, and save the cultural traditions connecting the past and the present, the individual and the community, men and nature and the gods. In the words of Hoppál shamanism is depicted as a "bridge and symbol, because it interconnects the traditions of the past with the present, and anchors the future of traditions". The shamans' movement started to come to light in the 1980s, organising cooperation with Michael Harner and other representatives of core shamanism from the United States since 1986. Miháli Hoppál strongly supports the neoshamanic revival in his country as a mean of ethnic revival, reproduction of ethnic identity, and he significantly contributed to the development of the local Hungarian Native Faith scene. There are significant differences between American and Hungarian neoshamanisms. Whilst the American movement provides a trans-cultural technique, designed as adaptable to different cultural contexts, and focussed on self-empowerment and healing application, the Hungarian neoshamanic movement is intrinsically an ethnic religious phenomenon. Táltos congregations hold weekly ritual gatherings; in addition, they organise collective pilgrimages and healing occasions. The participants celebrate together different rituals (rituals of inituation, rituals of passage, sweat lodges and fire-walk ceremonies, fertility, healing and purifying rites, either for the environment, the participants, the collectivity or the nation), perform shamanic drumming, and techniques of meditation and self-development. While the ceremonies are usually led by the táltos, the community actively takes part. The most well-known contemporary táltos are Zoltán Sólyomfi, István Somogyi, Fehérholló Öskü, and András Kovács-Magyar. The heterogeneity of Hungarian native faith churches shows the diversity of the views within the movement. Besides religious concepts, they differ from each other in the character of their activities. They are often gradual developments of táltos communities, or are established by individual táltos; these charismatic figures are considered by their followers valid spiritual leaders and while some act only in their local communities, others have national reputation. Their recognition and legitimacy is based on attributed healing and spiritual power, ritual efficiency and authenticity. The most influential organisations of this kind are the Yotengrit, and the Ősmagyar Táltos Egyház ("Ancient Hungarian Táltos Church" or "Arch-Hungarian Táltos Church"). Logo of the Noetic Táltos School. The Ancient Hungarian Táltos Church or Arch-Hungarian Táltos Church(Hungarian: Ősmagyar Táltos Egyház) was founded by András Kovács-Magyar, who later also founded the Noetic Táltos School (Hungarian: Szellemi Táltos Iskola). András Kovács-Magyar is a very popular shaman, and his religious enterprise is flourishing. The church promulgates the sacredness of the Pilis Mountains. The Traditional Church of the Order of Árpád (Hungarian: Árpád Rendjének Jogalapja Tradicionális Egyház) is a distinct group within the Hungarian native faith. It was founded in 2009 and makes reference to the Turanist emigrated ideologues Adorján Magyar and Victor Padányi, but it is inspired to the Traditionalist School, the Nouvelle Droite of Alain de Benoist, and to the concept of a common Indo-European paganism. The church's name is a reference to the Árpád dynasty. In recent years, Yotengrit became one of the most influential Hungarian native faith movements. Whilst this ethnic religion is considered by adherents as a faithful heir of the pre-Christian belief system, it could be defined as reconstructionist with various non-indigenous influences. The founder and leader of the movement is Imre Máté, who took part to the Hungarian Revolution of 1956, later emigrating to Germany where he became a businessman and poet. In the 1990s he was back to Hungary and founded the Yotengrit in his region of origin, proclaiming himself a táltos. The movement, based on Máté's ideas, proposes a dualistic theology: a masculine sky god named Gönüz, from a Turkic word for "Sun"; and a female mother goddess, Ukkó, identified with the Boldogasszony of the folk beliefs. The movement does not refuse completely the Finno-Ugric legacy of the Hungarians; religious tolerance and political neutrality are emphasised by the movement. Other groups of this stream are the Ancient Hungarian Church or Arch-Hungarian Church (Hungarian: Ősmagyar Egyház) and the Community of Hungarian Religion (Hungarian: Magyar Vallás Közössége). They are either connected to Turanist ideologues, and post-Turanist ones. Their common reference points are Badinji-Jós and Ida Bobula. Those táltos who espouse a Turanist ideology (id est the theory of the Hungarian kinship with the Turkic peoples) sometimes choose to affiliate with Tengrism, that is the Turkic ethnic religion. This is the case of Zoltán Sólyomfi, a renowned táltos in Hungary. These táltos are generally characterised by their used of the Turkic name of the Deity, Tengri, instead of the Hungarian indigenous one, which is Isten. 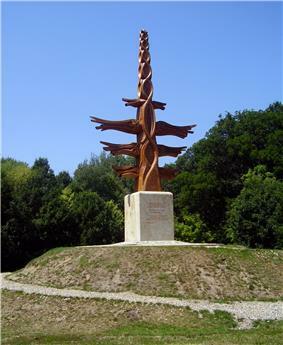 In 2012 a nine meters high életfa (tree of life) was gift by Hungarian Neopagans to the Tengrists of Kazakhstan. In the same year, Ojun Adigzsi See-Oglu, a famous shaman from Tuva, was invited to the Hungarian Parliament Building and performed a ritual dance around the Holy Crown of Hungary. ^ Un chamane au secours de la Hongrie!